Fifty years ago it was mind-boggling to think of a married couple not wanting to have children. Though the decision to abstain from child-rearing has become more common the shock of society seems to not have lifted at all. This is the subject of Kirkman's work. 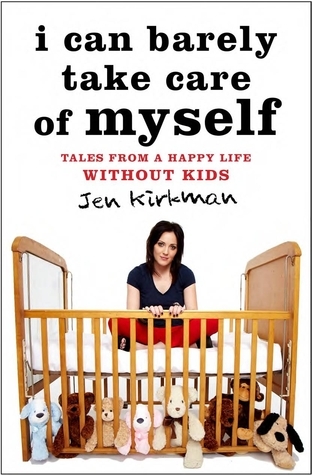 You may recognize Jen Kirkman from the roundtable of Chelsea Lately or even from her Drunken History videos. She is her mid-thirties and quite happy to be child-free. However, complete strangers cannot grasp this, and since Jen does speak about not having children in her stand-up act, these strangers feel ok to corner Kirkman and try to get her to change her mind. Jen tells several stories of being cornered by women who feel the need to get her to change her decision. I have experienced the situations that Jen describes in her book. It was nice to have someone voice my frustrations with the situation. When a stranger says that "oh, you'll change your mind," I am flabbergasted. Why does this person think that they know me more than I know me? My hope is that more women (and men) will be outspoken about their reproduction choice so that the decision will loose its taboo status. As far at the book, I felt it to be entertaining but a bit repetitive. I think this would be better delivered an as audiobook. I Can Barely Take Care of Myself was released this week. Visit your favorite indie store (or mine) to purchase this book.